A rotating postal worker strike that has caused disruptions across the country will affect most of the Greater Toronto Area on Tuesday. 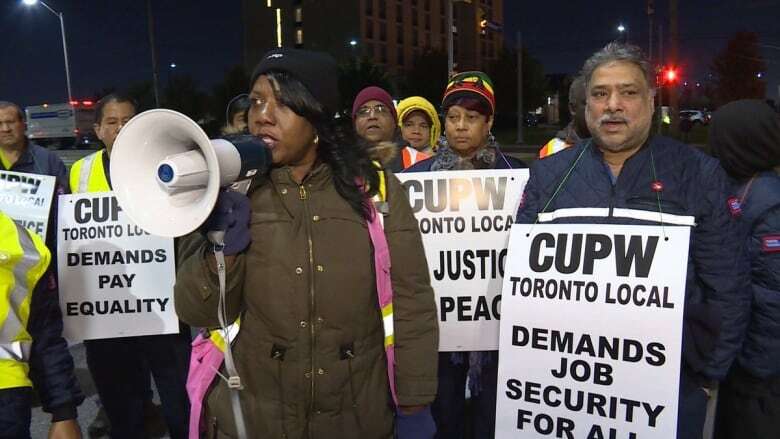 The Canadian Union of Postal Workers (CUPW) said late Monday that almost 9,000 of its workers in its Toronto local branch would walk off the job and head to picket lines at 12:01 a.m. ET. While affecting much of the Toronto area, Tuesday's job action will exclude Scarborough, the union said in a media release. The CUPW, which represents 50,000 postal employees, launched rotating walkouts in Victoria, Edmonton, Windsor, Ont., and Halifax on Monday to pressure Canada Post into accepting contract changes. Canada Post said in a statement Monday night that customers across Canada may experience delays for parcel and mail delivery since Toronto is a key processing hub. "The union's rotating strike will, therefore, have a significant impact on our operations," spokesperson Jon Hamilton said. "Canada Post will make every effort to minimize the impact." The union said Monday that both sides are still at the bargaining table and that the delays due to the job action are expected to be short. Mail delivery will resume the day after the rotating strike ends in that city, the CUPW said. The union said that it has been negotiating collective agreements with Canada Post for almost a year for the Urban Postal Operations and Rural and Suburban Mail Carriers (RSMC) bargaining units. The CUPW said its key demands for postal workers are job security, an end to forced overtime and overburdening, better health and safety measures, service expansion and equality for RSMCs. Canada Post said Monday it is committed to bargaining new collective agreements for its unionized employees, noting it has put forward "a significant offer" that includes wage increases, job security and improved benefits. "We always have back to work legislation in our tool box, [but] we're not anticipating using that in the near future."